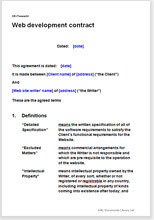 This is a contract document for a coder or software house to use for a small website or one that is comparatively simple technically, as draw using one of the popular applications. It is also suitable for any changes or additions to a website. You can present this contract to your client as a final version or for negotiation. It is flexible and easy to edit. This document will protect you from many legal pitfalls, but does not attempt to provide technical input for your specification of work. Technical material will be entered into the specification by you, the technical expert. Regulating customer changes to the agreed specification. There is an even more comprehensive agreement for original coding of a complicated website look at Website design and coding agreement: coder's version; major work. We have a set of associated documents at Website design agreements. "Very well organised and designed website - efficient, easy to follow and well-designed. Hope the content is as good as the website!"